A 4 mile circular walk from Ealing Hospital (as Uxbridge Road is dual carriageway this serves as a bus terminal for some routes). The walk is based on 2 Exploring Hanwell leaflets produced by Ealing Borough and a section of the Brent River Park Walk (also on the Capital Ring). The Uxbridge Road was a turnpike coaching highway and retains a horse trough on the central reservation. The Hanwell Bridge over the River Brent is Grade II listed. The parapet is 19th century and the arches are 18th century, possibly incorporating parts of the Medieval bridge. The Edwardian tiled Viaduct pub replaced the Horse & Groom Inn where Manor Courts and meetings were held. Boston Place Cottages (numbers 5-11) are early Victorian and 11a was a cart house. The green just beyond was laid out in 1903 on the site of a gravel pit. Opposite St Mark's School was built in 1855 to replace the National School in Halfacre Road. It was enlarged several times and acquired its grounds when adjoining market gardens closed in the 1960s. St Mark's Church was built in 1879 but declared redundant in 1980 and has now been converted to flats. Poor's Piece (King George's Field) was set aside for the poor under the enclosure act of 1816. It was purchased by Ealing Council in 1951 and laid out as a recreation ground. The school of the non-conformist Union Church of 1867 is now St Mary's Assyrian Church. At the end go right along the Broadway, crossing to the clocktower. This was erected for King George VI's coronation in 1937 (plaque). This was formerly the location of the Grand Theatre and fire station. Cherington House housed the Hanwell Local Board (formed 1885) from 1891. The Carnegie Library was designed by T Gibbs Thomas in 1905/6. At the end are the former Violin Workshops of WE Hill & Sons. The buildings which date to 1887-8 and 1904-6 closed in the 1970s. Right into York Avenue and left along Station Approach. Across Station Road at the end is Conolly Dell, a landscaped park with three small lakes. There is a memorial fountain to Dr John Conolly (physician of Hanwell Asylum 1839-44) as the park is part of the grounds of his house. This road was developed in the 1880s with large houses. There is a blue plaque on number 8, the home of painter William Yeames. The first Hanwell Station was built to the west in 1837. The present building of 1877 is Grade II listed with attractive canopies and ironwork. Number 122-8 is a large Georgian house, formerly called Elm Grove, which became an asylum in the Victorian era. Number 134 was originally St Vincent's Lodge and is the oldest surviving house in the area. Numer 136 was the lodge for The Grove whose grounds are now used by the golf club. It was rebuilt to its original design in the 1980s. Spring Cottage at number 99 dates from the early 19th century. The Hermitage was built by the church rector George Glasse in 1809 [pix]. St Mary's Church designed in 1841 by Sir George Gilbert Scott is the third church on the site. Its predecessors were a Georgian building of 1781-2 by T Hardwick and a Medieval thatched church. Gainsborough's daughters are buried in the churchyard. The gothic style Rectory Cottage was also built by Glasse in 1793 as a charity school, replacing an earlier building on the site. 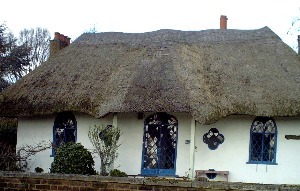 Its thatch was replaced by tiles after a fire in 1917. There is a well in the garden and the remains of the ancient parish brew house. Brent Lodge was sold to the council in 1936 and demolished but the stable block (c.1800) remains. The park has a zoo, cafe & toilets, children's playground and maze. The Wharncliffe Viaduct (Grade I listed) was built by IK Brunel in 1838 to carry the Great Western Railway over the Brent River valley. It was widened in 1877 when Hanwell Station was relocated. It is an impressive structure (sadly spoiled by the amount of 'tagging'). Follow the path underneath and across the river then continue to Hanwell Bridge. Look back to see the arms of Lord Wharncliffe on the viaduct. The path under the road (left fork) can be flooded in which case continue ahead, cross with care or at the lights to the left and rejoin the path opposite (Fitzherbert Walk). On reaching a wall on the right bear right up to the towpath and go right. 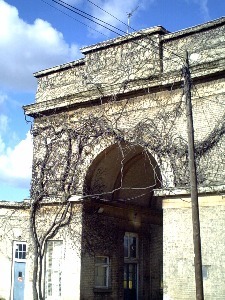 The wall is that of the former Middlesex County Asylum (see below). Further along is a blocked up entrance to Asylum Dock, used to convey materials such as coal by barge. The four rectangular holes were for fire hoses. The Grand Junction Canal (built by William Jessop in 1794) goes up 53' over ½ mile by means of a flight of six locks. 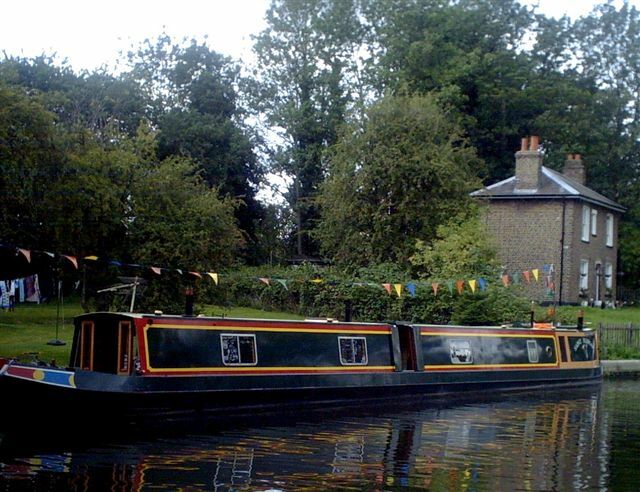 There are lock keeper's cottages at four of them plus side ponds, added in 1816 to save water. The locks (note dates) could accommodate a 14' barge or two 7' narrowboats. Continue to just beyond the road crossing overhead. This is known as Three Bridges, a scheduled ancient monument built by IK Brunel in 1855-6. The road is above the towpath and the railway below. Notice the grooves made by tow ropes at the bridge. Return and go up onto the road (Windmill Lane) and follow it northwards. This follows the western perimeter of the asylum. Some of the asylum buildings have been converted to apartments and the grounds infilled with new developments since 1991. Exit via Halliday Square into Uxbridge Road and go right. Go through the large arch on the right [pix] or if this is closed continue until the wall finishes and go around to the inside of the gateway. Walk towards the chapel. Former asylum buildings are now part of St Bernards Hospital. Walk through to the new buildings of Ealing Hospital and the bus terminus. Additional buses are available in Uxbridge Road. The Middlesex County Asylum (commonly known as the Hanwell Lunatic Asylum) was built on a 44 acre site in 1829-31. It was noted for its humane methods for the treatment of mental patients, including the use of employment therapy. Its facilities, including workshops and gasworks, made it virtually self-sufficient. It was extended in 1838 and the 1850s. The iron fire escapes were added from 1860 and the chapel, in early English style, was built in 1880. Originally designed for 300 patients the number rose to 2750 in 1916. Between 1888 and 1948 it was controlled by the LCC and in 1990 was attached to the new Ealing Hospital. It was renamed St Bernards in 1937.